Without question, the Prague Castle district was always the first thing whenever I reached downtown Prague and looked over the Vltava river. The first photograph shows this scene from approximately the Prague Opera House. It shows the huge Prague Cathedral (St. Vitus) perched high on a hill, surrounded by the massive colorful walls of the castle itself. Lording over the Vltava River was the famous Saint Charles Bridge, shown in the Mala Strana chapter. Prague may have had well over a dozen huge and impressive landmarks, but that scene was my absolute favorite. Visibly surrounding the Cathedral was a fortress, including of the green and yellow walls to the round tower at middle right. 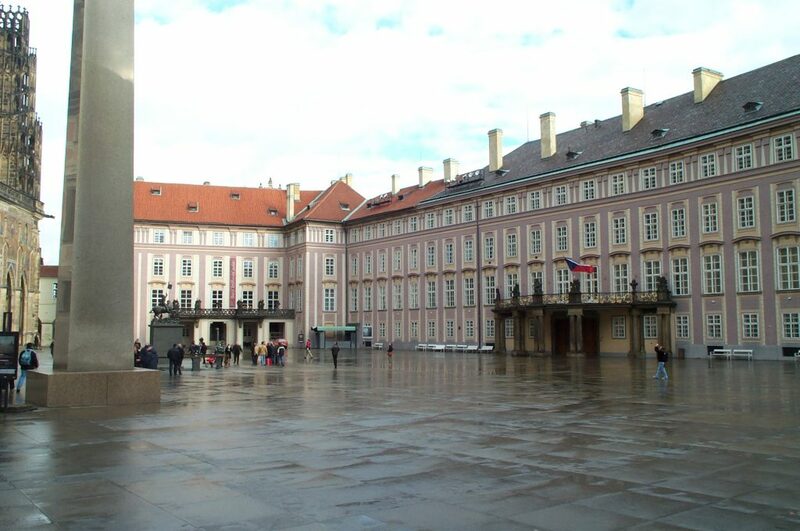 This was known as the Hradčany (hrahd-CHAHN-ee), the Castle District. It was big, beautiful, and busy with loads of tourists. Prague’s unpredictable weather may occasionally drive some away from other parts of the town, but the throngs always braved the elements to get to the Castle. There was always something going on and plenty to look at. The Castle District encompassed about a square kilometer of territory on the north side of the Malá Strana. It was separated by the Uvoz Road and bounded by the Patočkova Highway to the west and north and the Badeniho Road to the east. The district outside the castle grounds was forested or parks, with remnants of the old bastions still intact and narrow almost-impassible streets snaking around the hills out of sight from the touristy areas. Significant parts of the District were off-limits, particularly the royal parks immediately around the castle, but then again, people did not go there to visit the parks. I found two different ways to climb the hill up to the Castle — the easy way and the hard way. Thankfully it did it the easier way by climbing up the hills of Malá Strana from St.Nicholas’ Church. It was a good steady climb. An even longer and steeper climb was on the eastern side along Staré zám schody, which I would not recommend. If getting there on foot was not in the cards, the good news was the presence of a bus stop on the highway to the north. This took visitors to a parking lot level with the Castle’s northern entrance. Both times I went, my first impulse was to walk around and gawk at all the huge, colorful structures like the Castle entrance shown in the second photograph, or the main hall shown in the third. I loved the rich detail and the terrific colors of all the structures. They were refreshingly not uniform in architecture, design, or history, so each turn produced a new sight. The information booth, containing the ticket counter, was located inside the first passage. The good news was that I could enter most of what I wanted to without buying any tickets, but to see the best stuff I would have had to pay and be able to devote a couple hours. 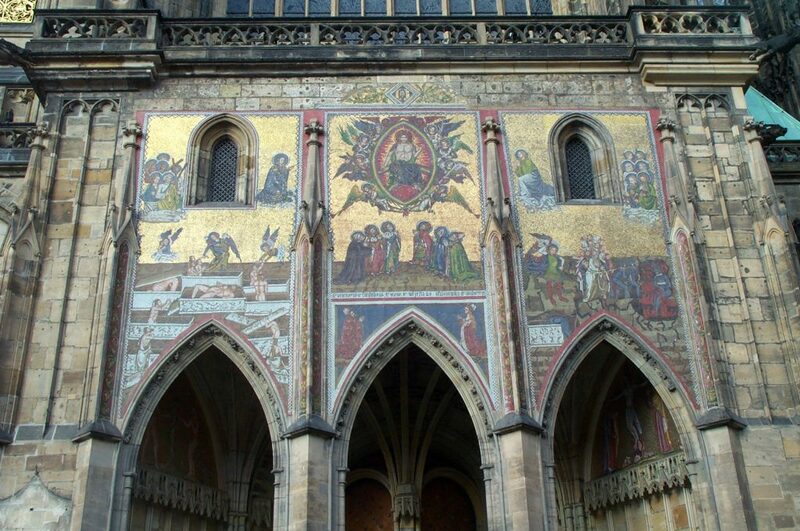 For example, anyone could have entered the St. Vitus Cathedral and walked around the main part of the church. But, to visit the gorgeous chapels in the nave required the extra ticket. 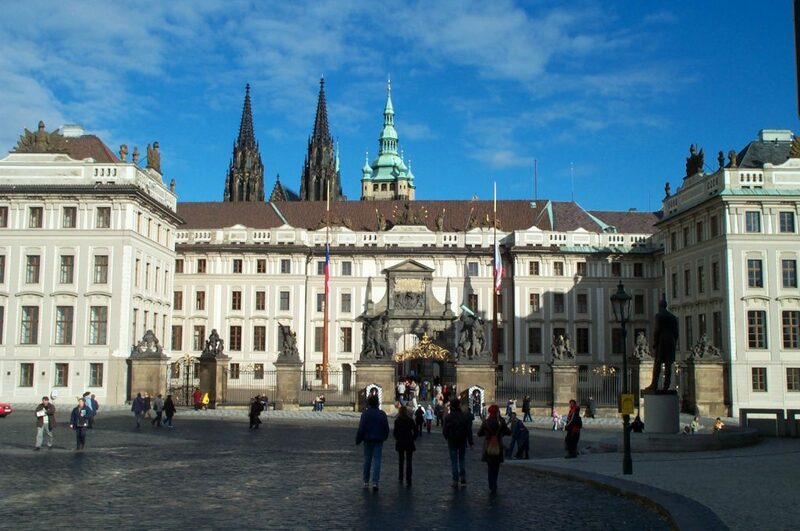 St. Vitus’ Cathedral was my favorite building in the Hradcany. The fourth photograph shows the bright and colorful artwork over the recently renovated southern entrance. The artwork inside the church was just as stunning. I noted how the massive stained glass windows came in completely different styles from each other, probably indicative of various times when the church has been damaged and restored. The murals inside were extraordinary, and the sheer of the structure was overwhelming. For the extra ticket, I could have visited the crypt below the Cathedral where several notables (including Charles IV himself) were buried. The crypt was constructed underneath a huge ivory royaltomb placed in front of the altar. The tomb was elaborately carved, and was encased in thick plexiglas for protection. The eastern side of the Castle grounds has several museums, souvenir shops, cafeterias, and the adorable St. George Basilica. The shops were all surprisingly inexpensive given how they were all clearly tourist traps. That part of the town was originally where the goldsmiths and merchants lived, along tight streets with colorful row houses. 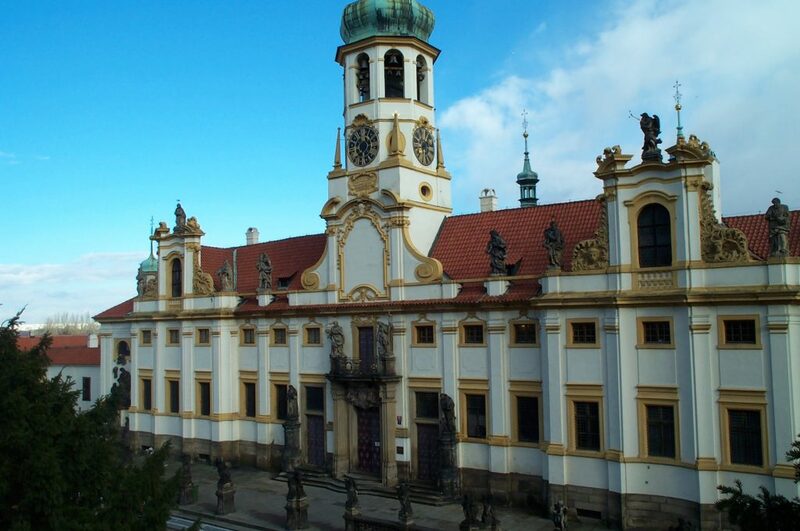 Other attractions were a red Romanesque church and the Prague Toy Museum, a modernized structure at the eastern entrance that showcased Bohemian-produced toys. I visited the Powder Tower Museum, built inside a large, wide tower that served as the Hradcany’s dungeon. I ventured out the northern entrance past the parks, but as earlier indicated, these were not open to the public. 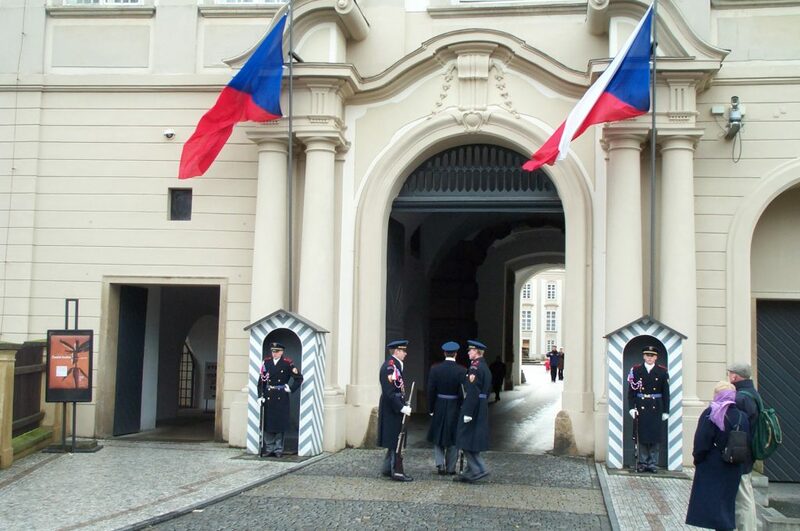 In fact, many of them were heavily guarded — probably because my most recent visit occurred mere days before the NATO Prague Summit of 2002. After finding little interesting in that direction, I returned to go back into the castle when I chanced upon a changing of the guard ceremony. I captured it in the fifth photograph. It was simple and quick ceremony, lasting less than a minute. But it was conducted sharply and the small assembly of tourists with me clapped as the outgoing guard marched off. Having finished touring the castle grounds, I headed west. The main attraction at that end was the Lareto, shown in the sixth photograph. The Lareto was an exquisite building with dozens of sculptures lined along the front. It was billed as a place of pilgrimage and an old treasury, but I unfortunately didn’t have time to visit its museum. In between the Lareto and Castle was a large pedestrian district, with lots of fresco-laden buildings and really cool bright green lampposts. Beyond the Lareto to the west, however, I found myself in the upper residential district. It was nice, but not so interesting for tourists. Prague was a huge city, certainly too huge to enjoy all of it in one day. But for those visiting Prague for just a day, the Castle District was the best place to start.